The new movie theater in Bethel lit up its screens last week on Independence Day. It was the grand opening for Suurvik Cinema, the only theatre for hundreds of miles in a vast stretch of Alaska. A long line of excited moviegoers are ready for the first big screen viewings in Bethel for over thirty years. Bethel resident Ronald Jennings Jr. says it’s a big deal for him. “It’s like one of the first movies that I get to watch in a movie theater. I only did it a couple of other times and that was in Juneau so I’m pretty excited for it being here in Bethel, and that they had the courtesy to bring anything like this to a rural area,” say’s Jennings. The theater is a part of the Kipusvik Complex, which is owned by the Bethel Native Corporation. President and CEO Ana Hoffman opened the theater with a ribbon cutting ceremony, she presented BNC board members who used traditional ul’uaqs to cut the ribbon. 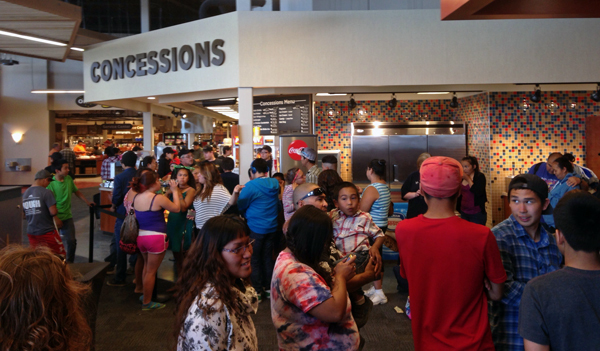 After buying their tickets customers move into one of the two theaters with their snacks. Most adults and couples choose the comedy “22 Jump Street”, but Alexis Kinegak chose the children’s adventure: “How To Train Your dragon 2, it was fun and little bit sad,” Says Alexis. Alexis’s mom is Yvonne Kinegak says she was an employee at the last movie theater in Bethel; the Swanson’s Theatre, which closed in the early 80s. “It feels really good to be in Bethel and watch a movie. I used to run the movies at the old theater, so it feels really good to have a theater back here, a place to hang out for the kids and it’s just exciting so I’m very happy,” says Kinegak. Suurvik is the Yup’ik translation for “movie theater.” Suurvik Cinema will be open weekdays in the evenings, and begin operations early afternoon on weekends.